The Geo Princess Mimi lens is for those who are playful at heart. Available in three colors – grey, brown and green for just $25 it will make you the centre of attraction. 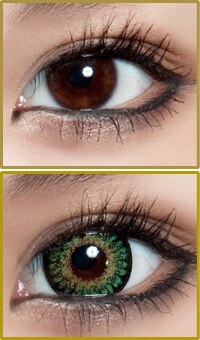 The black rim circle lens giving an amazing big eye effect. With 38% to 42% water content your eyes would remain relaxed and fresh throughout the day and you will feel beautiful and confident wearing these lenses. These lenses are some of the most well-known on the market and I can see why; the design is appealing, the color is lovely and the enlargement effect is just right! It's a great versatile lens that will work for cosplay, gyaru, j-fashion and more!